Hello friends. I have actually been writing on this same topic some time ago as well. And here I am with the results and also help you earn 5$+ per week just by searching on search engines online. 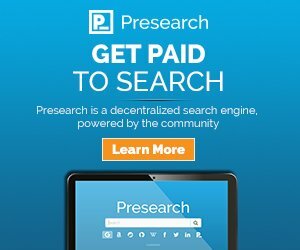 This awesome decentralised platform that pays you for searching is Presearch .It actually pays you PRE tokens which later can be exchanged for Bitcoin through exchanges and eventually to fiat. You can earn 8 PRE tokens a day for making 32 searches . The price of PRE at the time of writing this post is $0.094993. You earn 7×8=56 tokens a week and with the current price 56× $0.094993= 5.31$ . That's not much amount but you are getting it just for making searches online. Presearch seems to be promising project. I have been using this for a month now. You can join now and start making free and easy money online. Sign up through the link below and get 25 PRE tokens for free. @neupanedipen,I find this topic interesting, I am glad you are Nepali, & you're progressing well in steemit. I will use Presearch for sure. Thanks for this post. Thank you so much. Its great to see Nepali brothers here in steemit. Presearch is another easy project to earn some free cryptos. Keep going bro. Sounds nice kinda reminds me of bing and earning giftcards, but i can only use it if i create an account? Yes you will only earn PRE tokens if you registered an account. You can register from the link above and get 25 free tokens. Thanks for the post on this, and I did sign up with your link. I didn't know about this site until now and so far im liking it. Lots of customization's. Thank you! You can consider joining it to earn easy money. Have you exchanged them for Bitcoin ? I haven't reached the threshold to take payout. You need 1000 tokens to withdraw (they are working to lower the threshold amount). I have seen some authentic payment proofs so I can say that you are not wasting time for nothing. Ohk. I used to use it earlier but then I stopped as I wasn't sure if I will get paid. I'll resume the search.